Surf’s up! 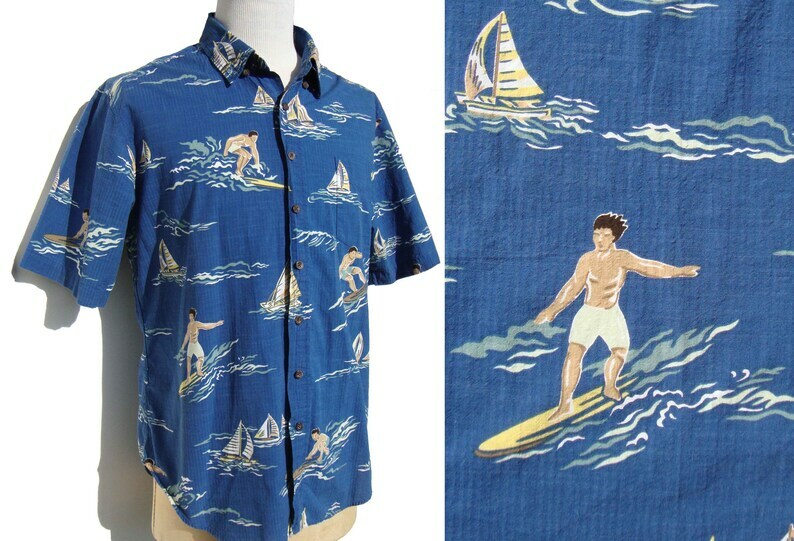 In this fun vintage aloha shirt featuring a male surfer catching the waves, by Reyn Spooner’s Hawaiian Traditionals. The breezy shirt consists of a puckered seersucker cotton fabric, with large size print of surfers and sailboats on the open water, in colors of teal, ecru, sandy beige, brown, and white, over a soft indigo blue. It has short sleeves, pointed collar, button down placket, patch pocket, and an embroidered label for “Reyn Spooner”, “Hawaiian Traditionals Since 1956”, and a fabric content label which includes a size of “XL”, “100% Cotton”, “Designed in Hawaii”, “Made in China”.